The World Cup has gained extra prestige after changing to a biennial rather than an annual team event, according to 2010 US Open champion Graeme McDowell. "I said two years ago I felt the World Cup was lacking respect but this year’s field seems a lot stronger than it has in years gone by," the Northern Irishman told reporters at Mission Hills on Tuesday. "It is great to see teams supporting it. When you look at the flags at the back of the practice range and you see guys like Arnold Palmer and Jack Nicklaus have won it, it kind of puts in perspective what kind of event this is. "Given it is now a biennial event it gives guys perhaps a little extra time to prepare and get their schedules ready and come and support this event because it is special and you’ll be having your names alongside some very special names if you win." McDowell said he and partner, 2011 U.S. Open champion Rory McIlroy, were keen to take the trophy back to Ireland for the first time since Padraig Harrington and Paul McGinley won in 1997. 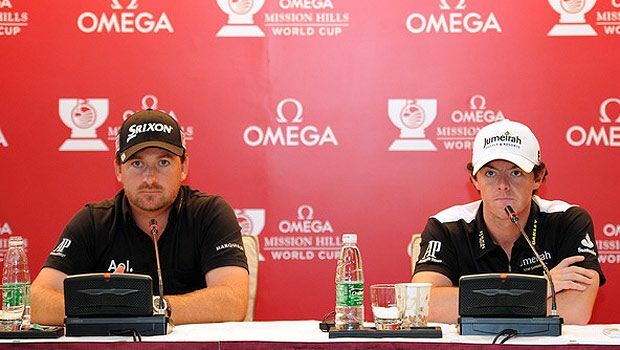 "Rory and I are taking it very seriously and we would certainly love this to be on our resume," said the world No. 14. The two Northern Irishmen are teaming up again under Ireland’s colors as they look to go one better than the last edition two years ago when they were pipped on the final day by the Italian brothers Francesco and Edoardo Molinari. There are several powerhouse lineups in the field this week including United States who are represented by world No. 10 Matt Kuchar and Gary Woodland, winner of the Transitions Championship in Florida in March. "The World Cup has so much history that it rates highly," said Kuchar. "You look at the past champions and how great they were, any time you can put you name on a list like that, or even attempt to put your name on a list like that, it’s a big deal."